The Village at Pebble Lake by NK Homes, an idyllic community in New Kent, is full by 75 percent. Luckily, if you have been looking at a property in The Village at Pebble Lake, now is the time to buy. NK Homes predict that by the end of the summer the community will be completely full. The Village at Pebble Lake offers a value you can’t beat. A brand new maintenance-free townhome starting in the low $200’s is an amazing deal for this area. 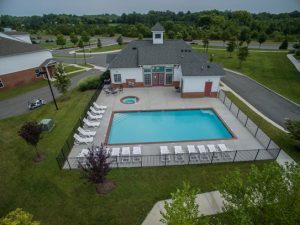 It is situated in a great location within Mechanicsville in Richmond, Virginia. This community allows you to enjoy a higher quality of life without worrying about the maintenance that comes with homeownership or unexpected repairs often associated with buying a property that’s previously been occupied. Maintenance free living is a huge draw to this community. Imagine not having yard maintenance including snow shoveling and leaf raking. This is also beneficial if you have health or age-related conditions that make it difficult for you to maintain your own property. 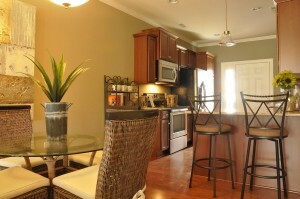 The townhomes feature a desirable open floor plan. This accommodates foot traffic across hardwood floors and conversation around the gourmet kitchen and into the living room. Open concept floor plans enable you to fully enjoy your new townhome, feeling connected to each space and as memories are made. All townhomes in The Village at Pebble Lake feature stainless steel appliances, hardwood floors, ceramic bathtubs and walk-in showers. Oak stained stairs, tray ceilings, crown molding and wrought iron railings are some of many premium details also available. Close access to I-64 and I-295 make this is a highly sought after location. The community is close to shopping centers, trendy restaurants, grocery stores, local gyms and more. Whether you work in or out of Richmond, having easy access makes all the difference in deciding to call The Village at Pebble Lake home. Hanover Public School Systems serves the New Kent area, more specifically Battlefield Elementary, Stonewall Jackson Middle and Lee Davis High. The Village at Pebble Lake is a thriving community for children to live in as they progress through school in an excellent, highly-rated school system. The Village at Pebble Lake clubhouse and pool is a popular attraction where much of the excitement happens in this community. Relax and enjoy the benefits of a swimming pool without the maintenance, and socialize with neighbors inside the accommodating clubhouse. Learn more about the Village at Pebble Lake, view floor plans and schedule a tour.